Funny enough, this screenshot was taken for the header image for the blog “It’s a pet-eat-mob world“, which was Petoholics’ predecessor. 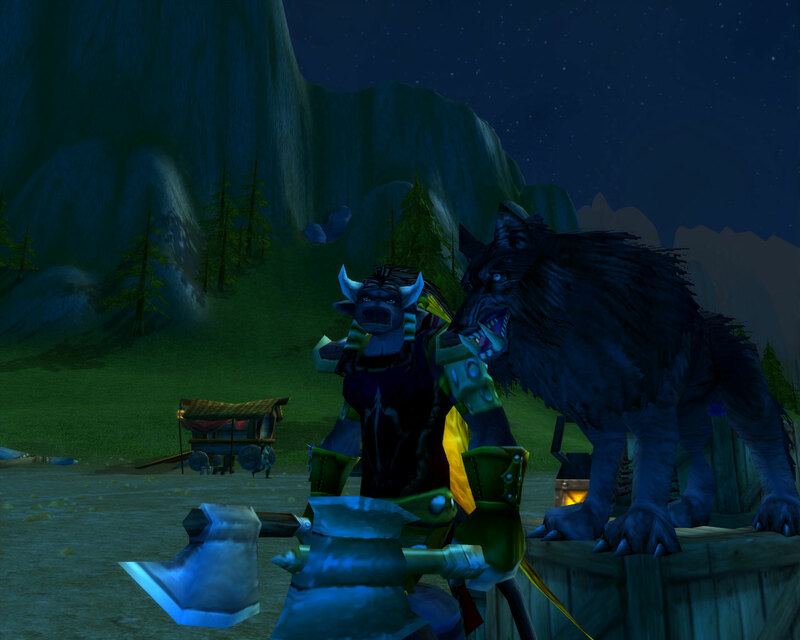 And yes, that is Niqora (then known as Nicora and on her original server, Hydraxis) with her black worg called Blacky, because she was only level 36 and not even a high enough level to tame Blacky’s current incarnation. Ah, brings back memories, doesn’t it? Things like Steady Shot, kiting, and epic mounts were just vague phrases that all those spiffy level 70 hunter bloggers used. Heck, at that time Niqora didn’t even have A mount and was still trotted around with Aspect of the Cheetah. And I am shamed to admit that her first aid skill was still at 1 (I smartened up eventually though). Thanks for the trip down memory lane and if there’s anyone who hasn’t been tagged to do this (I’m looking at you Myst and Ticalos aka Latigo), get on it! I promise it will be fun. Comments closed — Trackbacks closed RSS 2.0 feed for these comments This entry (permalink) was posted on Saturday, March 7, 2009, at 1:58 pm by Faeldray. Filed in Musings, Random Thoughts and tagged Niqora. « What does your pet(s) mean to you? The only problem with this is my 6th screenshot maybe of me playing alliance *shudder*. Cait\´s last blog post…Guest Spot Tuesday – "De-throne"
@ Cait: The one thing that really bugs me about worgs…they don’t have the howling animation. I LOVE hearing Blacky howl.